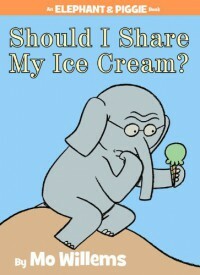 This book is about an elephant named Gerald must decide whether to share his ice cream with his friend Piggie. Gerald shares his thoughts about what he is feeling about sharing with Piggie. Gerald spends so much time debating whether or not to share his ice cream that it has all melted by the time he has decided to share, but Piggie shows up with an ice cream cone and offers to share with Gerald. I would use this book in younger grades to discuss sharing with peers. I making ice cream cones as an activity and writing something like I can share... on the cone and then writing a few things that they can share on 3-4 ice cream scoops to display.